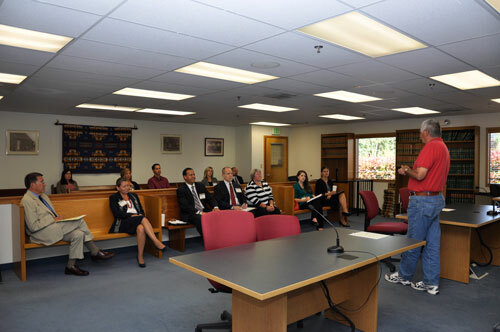 Tulalip tribal elder and Elders Panel member William Shelton, now deceased, explains how the diversion program works to the Indian Law & Order Commission in their visit to Tulalip Tribal Court in September 2011. TULALIP, WA – The 2012 Annual Tulalip Tribal Court Report states 415 criminal cases were heard in court. Included in that 415, are 24 newly filed criminal alcohol charges and 69 disposed, meaning judicial proceeding have ended or a case that has been resolved. Also counted in that 415, are 76 newly filed criminal drug cases and 126 disposed. Helping to tackle these numbers is a group of volunteer Tulalip elders, who are teaching offenders accountability in a traditional way, and saving the court thousands of dollars. In it’s sixth year, Tulalip Tribal Court’s Elders Panel is a diversion program that uses traditional Tulalip culture and the wisdom and experiences of Tulalip elders to reach first-time offenders and eliminate re-offending. The panel meets every two weeks with non-violent first-time offenders, ages 18-42, who have been charged with minor criminal offenses such as possession of alcohol or marijuana, or criminal mischief. Currently the panel consists of Donald Hatch Jr., Lee Topash , Dale Jones, Arthur Hank Williams Sr., Eleanor M. Nielson, and Katherine M. Monger. Enrollment in the program is voluntary but comes with a large incentive to complete it. Defendants receive deferred prosecutions on their criminal charges for the length of their enrollment in the program, usually a year. Upon successful completion of the program, charges are dismissed. This is the one of the largest incentives a diversion program can offer a first-time offender; it is a chance to rebuild a life. The panel requires defendants to actively engage in their community and culture to learn the impact their actions create, not just in their life, but the lives of their family members and community members. Requirements include regular appearances before the panel, writing letters of apology, community service, substance abuse treatment, curfews, UA’s, anger management classes, mental health evaluations, and no new violations. Cultural participation can include family research and traditional spiritual activities. According to court estimates, the panel typically handles 10 cases a year, saving the court an average of $20,000 a year in judicial and probation time, including jail cost, which can run the Tribe $67.92 a day for each incarcerated tribal members, sentenced through Tulalip Tribal Court, and a $97 booking fee. “There are costs that we cannot measure in terms of costs to society when young offenders are before Elders Panel and follow the sanctions sentenced by Elders Panel, and are not committing any new crimes,” said Tulalip Tribal Court Director, Wendy Church. “We like to play the role of the grandfather and grandmother because we want to give advice that a grandfather or grandmother would give,” said Hatch about the cultural approach portion of the program. Many of the positive changes in a defendant’s behavior early on in the process can be attributed to regular meetings. In small communities such as tribal communities, it is not unusual for participants to be familiar with elders on the panel. This eliminates the clinical judicial feel experienced in typical judicial diversion programs. This can be considered the program’s greatest keys to success. Although some offenders will re-offend, Elders Panel sees an 87 percent success rate in participants. In 2009, the Tulalip Tribal Court’s Elders Panel was recognized by the Washington State Bar Association (WSBA) for the Local Hero’s Award. The WSBA Board of Governors searches statewide for noteworthy programs that have made substantial contributions to their communities, this recognition is bestowed upon non-lawyers. For more information about the Elders Panel or to volunteer to be on the panel, please contact Tulalip Tribal Court at 360-716-4773. This entry was posted in Local News, Tulalip News and tagged Elders Panel, Tulalip, Tulalip Elders, Tulalip Tribal Court, Tulalip Tribal Court Elders Panel, Tulalip Tribes by admin. Bookmark the permalink.